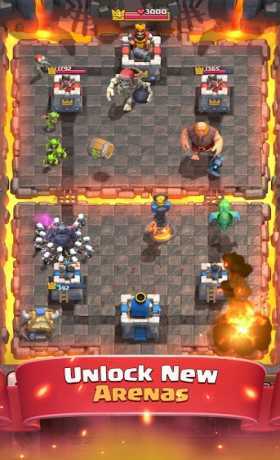 Clash Royale is a strategy game in real time, where you fight against other players online in frantic duels. 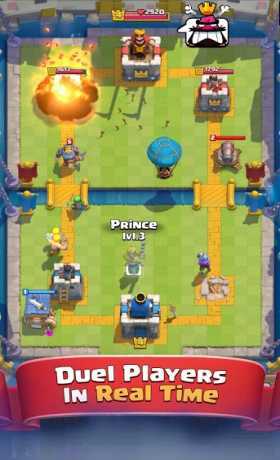 Clash royale android game is a very popular and super-beautiful game from Supercell, the creator of the popular games of clash of clans and boom beach which is provided for various operating systems and its Android version has been downloaded by android users from around the world more than 500,000,000 times from google play today and is one of the most popular! The Clash Royale is also designed as clash of clans game and You compete with online users around the world! Like all MOBA genre games in this game, the goal is to send troops to enemy troops to destroy the towers and overthrow their king! At the same time, protect yourself from the realms of your kingdom, relying on magic, defenses, and soldiers you have! 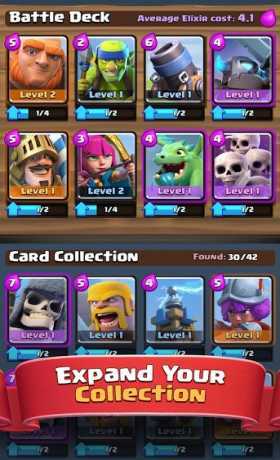 In an incredibly beautiful Clash Royale game, you have a wide range of cards to help you create a battle deck to send to the battlefield. You can even create a cologne for yourself in a game where you share your cards with other members! many of the characters in Clash Royale are the familiar characters of the clash of clans game though you will see new characters like Princesses, Knights and Little Dragons! the new update for the Clash Royale game today is the introduction of your loved ones that you can get it with a single click and become addicted to it for days! Tap on News Royale in-game for the full update details – it’s a big one! We want private server (mod) with unlimited coins and gems. Thanks ?